The next generation of senior citizens will be sicker and costlier to the health care system over the next 14 years than previous generations, according to a new report from the United Health Foundation. The report looks at the current health status of people ages 50 to 64 and compares them to the same ages in 1999. The upshot? There will be about 55 percent more senior citizens who have diabetes than there are today, and about 25 percent more who are obese. Overall, the report says that the next generation of seniors will be 9 percent less likely to say they have good or excellent overall health. That's bad news for baby boomers. Health care costs for people with diabetes are about 2.5 times higher than for those without, according to the study. It's also bad news for taxpayers. "The dramatic increase has serious implications for the long-term health of those individuals and for the finances of our nation," says Rhonda Randall, a senior adviser to the United Health Foundation and chief medical officer at UnitedHealthcare Retiree Solutions, which sells Medicare Advantage plans. Most of the costs will be borne by Medicare, the government-run health care system for seniors, and by extension, taxpayers. Some states will be harder hit than others. 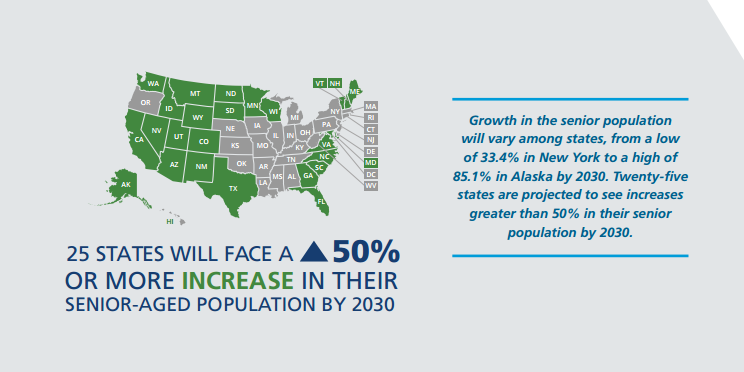 Colorado, for example, can expect the numbers of older people with diabetes to increase by 138 percent by 2030, while Arizona will see its population of obese people over 65 grow by 90 percent. There is some good news in the report, too. People who are now between 65 and 80 years old have seen their overall health improve compared to three years ago. And people who are aging into the senior community are far less likely to smoke than earlier generations. "Some of these trends are very good and in the right direction," Randall tells Shots. She says the decrease in smoking shows that it's possible to change health behaviors, noting that doctors, public health professionals and policymakers used a variety of strategies simultaneously to reduce smoking. "That's a good model for what we need to look at to tackle the epidemic of diabetes and the big concern we have around obesity," she says. The study also ranked states on the health of their current senior populations. Massachusetts topped the list, jumping to No. 1 from the No. 6 ranking it had the last time the rankings were calculated. Vermont slipped to No. 2. Louisiana is the least healthy state for older adults. 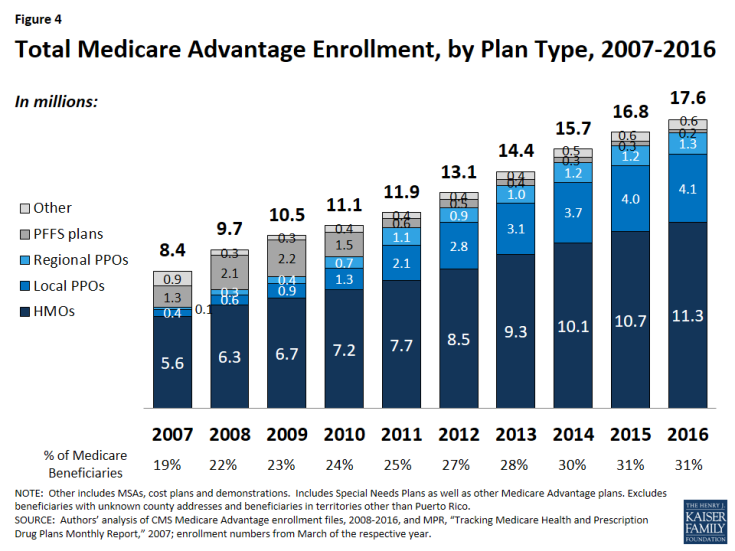 The number and share of Medicare beneficiaries enrolled in Medicare Advantage has steadily climbed over the past decade, and this trend in enrollment growth is continuing in 2016. The growth in enrollment has occurred despite reductions in payments to plans enacted by the Affordable Care Act of 2010 (ACA).1 As of 2016, the payment reductions have been fully phased-in in 78 percent of counties, accounting for 70 percent of beneficiaries and 68 percent of Medicare Advantage enrollees. 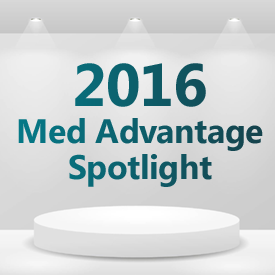 Medicare Advantage enrollment has increased in virtually all states over the past year. 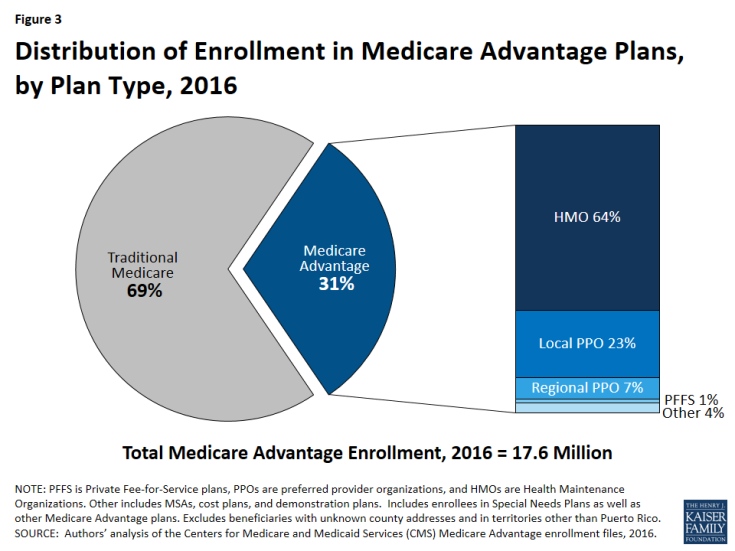 Almost one in three people on Medicare (31% or 17.6 million beneficiaries) is enrolled in a Medicare Advantage plan in 2016 (Figure 1). The penetration rate exceeds 40 percent in 5 states. Over 3 million enrollees (18%) are in a group plan in 2016. UnitedHealthcare and Humana together account for 39 percent of enrollment in 2016; enrollment continues to be highly concentrated among a handful of firms, both nationally and in local markets. If Aetna acquired Humana with no divestitures in 2016, the combined firm would account for 25 percent of Medicare Advantage enrollees nationwide. On average, premiums paid by enrollees were relatively constant between 2015 and 2016 ($37 per month in 2016 versus $38 per month in 2015), although premiums vary widely across states, counties, and plan types. Medicare Advantage plans, unlike traditional Medicare, are required to provide an out-of-pocket limit (not to exceed $6,700) for services covered under Parts A and B. In 2016, the average enrollee had an out-of-pocket limit of $5,223 – nearly $1,000 higher than it was in 2011 ($4,313). 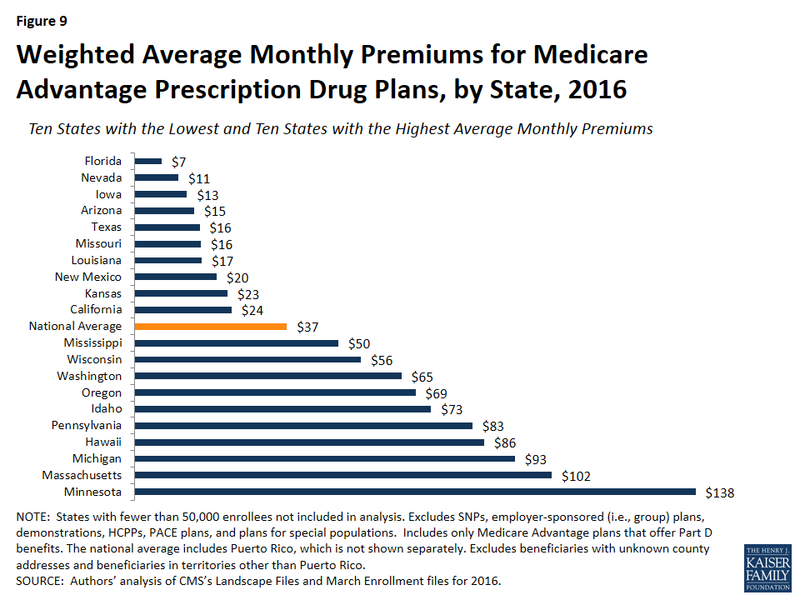 More than one-third of all enrollees in Medicare Advantage prescription drug plans in 2016 (37%) are in plans with limits at the maximum. In 2016, 17.6 million beneficiaries – 31 percent of the Medicare population – are enrolled in a Medicare Advantage plan (Figure 2). Total Medicare Advantage enrollment grew by about 0.9 million beneficiaries, or 5 percent, between 2015 and 2016. 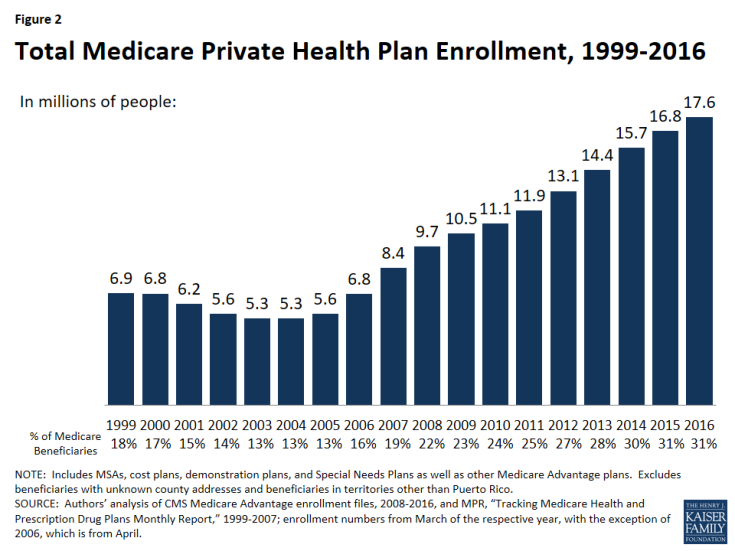 Although this is a slower rate of growth in percentage terms than any year since 2006, the growth reflects the ongoing expansion of the position Medicare Advantage plays in the Medicare program. 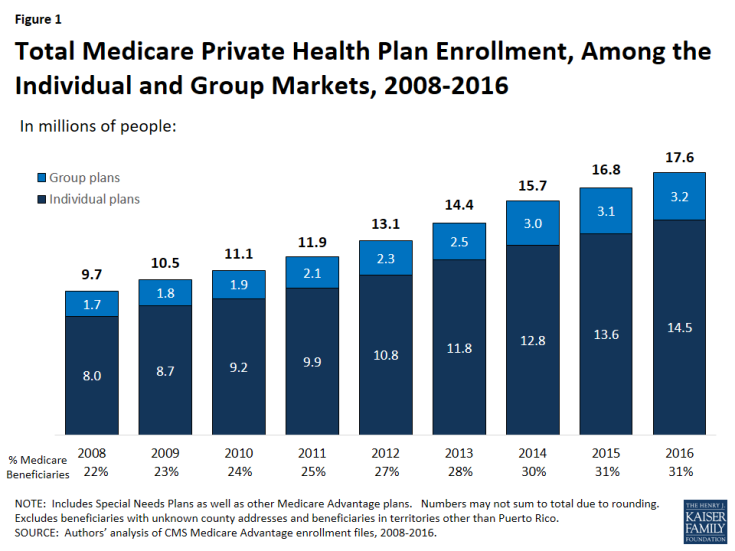 The growth in Medicare Advantage enrollment reflects both the influence of seniors aging on to Medicare as well as small shifts in the larger pool of beneficiaries in traditional Medicare switching to Medicare Advantage plans. Enrollment in HMOs increased by 0.6 million to 11.3 million beneficiaries in 2016 (Figure 4 and Table A1). Enrollment in local PPOs and regional PPOs increased by 0.1 million each, with 4.1 million beneficiaries in local PPOs and 1.3 million beneficiaries in regional PPOs 2016. A key difference between an HMO and a PPO is that the latter provides enrollees with more flexibility to see providers outside of the plan’s provider network. Local PPOs, like HMOs, are required to serve areas no smaller than a county, whereas regional PPOs are required to serve areas defined by one or more states with a uniform benefit package across the service area. In 2016, enrollment increased in all states in 2015, with the exception of Ohio where enrollment declined by 8 percent, in large part to the Ohio Public Employees Retirement System pulling out of the Medicare Advantage group market and ceasing to sponsor a Medicare Advantage plan (Table 1). In 9 states (DE, IA, MD, ME, MS, MT, ND, NH, and SD) and the District of Columbia, enrollment increased by more than 10 percent – double the national average – including four states (DE, IA, ND, and NH) in which enrollment increased by more than 20 percent. All of these states have Medicare Advantage penetration rates far below the national average with relatively few enrollees and their growth rates are sensitive to small changes in enrollment. 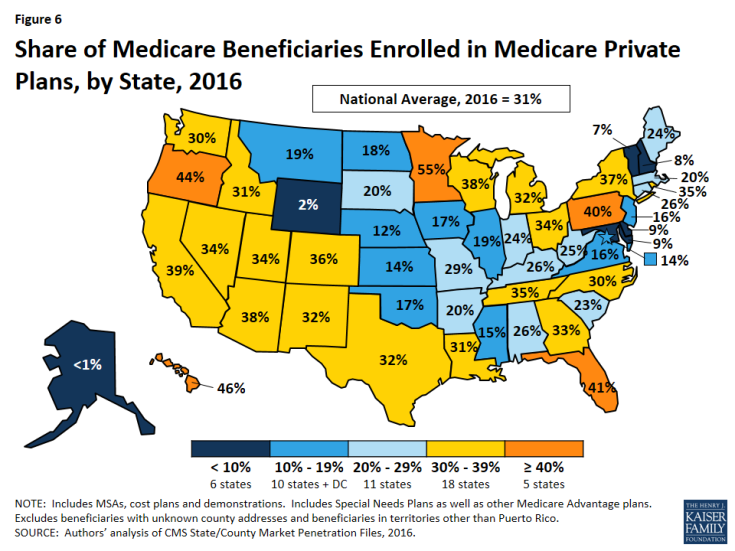 In 23 states, at least 30 percent of Medicare beneficiaries are enrolled in Medicare private plans, including 5 states (FL, HI, MN, OR, and PA) in which at least 40 percent of beneficiaries are enrolled in Medicare private plans (Figure 6). These five states account for 21 percent of all Medicare private plan enrollees. While Medicare Advantage enrollment is increasing in many states, Medicare Advantage enrollment continues to be very low (less than 10 percent of Medicare beneficiaries) in 6 states (AK, DE, MD, NH, VT, and WY). This variation reflects the history of managed care in the state, the uneven prevalence of employer-sponsored insurance for retirees, and growth strategies pursued by various Medicare Advantage sponsors, among other factors. Within states, Medicare Advantage penetration varies across counties. For example, 44 percent of beneficiaries in Los Angeles County, California are enrolled in Medicare Advantage plans compared to only 11 percent of beneficiaries in Santa Cruz County, California. Medicare Advantage enrollees are responsible for paying the Part B premium, in addition to any premium charged by the plan. 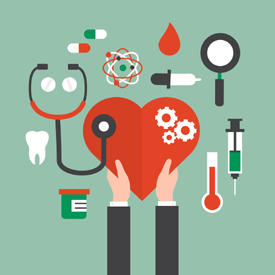 The Medicare Advantage premium paid by enrollees reflects the difference between the plan’s costs of providing Part A and B benefits and any supplemental benefits offered, and the federal payment to the plan for Part A and B benefits. Plans receive a percentage of the difference between their bid and the maximum federal payment (known as a rebate) and are required to use this amount to offer extra benefits, reduce cost sharing, or reduce the Part B premium. If the plan includes the Medicare Part D prescription drug benefit, as most plans do, the plan may also use the rebate to reduce the Part D premium. This brief analyzes premiums for Medicare Advantage plans that offer prescription drug benefits (MA-PDs) because the vast majority (89%) of Medicare Advantage enrollees is in MA-PDs and Medicare Advantage enrollees who seek Part D prescription drug benefits are, for the most part, required to get them through their plan if the plan offers prescription drugs. The average MA-PD enrollee pays a monthly premium of about $37 in 2016, about $1 per month (1%) less than in 2015 (Figure 7). 7 Actual premiums paid by enrollees vary widely, across and within counties, by plan type and other plan characteristics. Average premiums range from $28 per month for HMO enrollees to $63 per month for local PPOs and $76 per month for PFFS plan enrollees (Table A4). 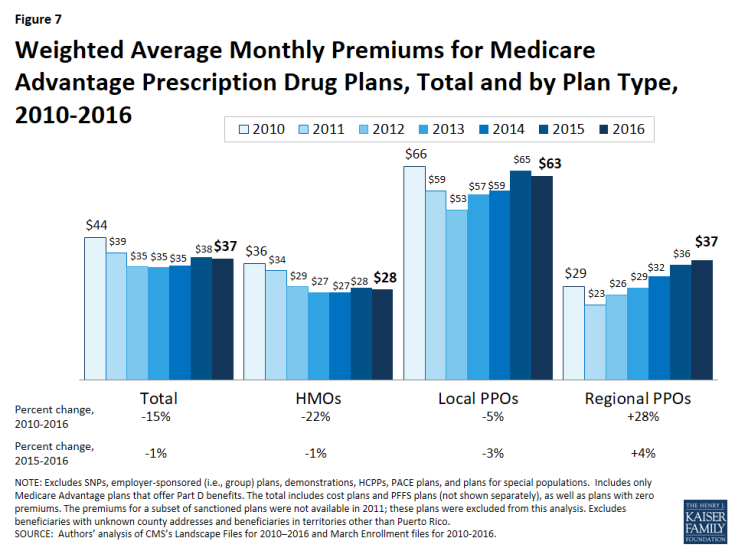 Since the ACA was enacted in 2010, average Medicare Advantage premiums paid by HMO enrollees and local PPO enrollees have decreased and average premiums paid by regional PPOs and PFFS enrollees have increased. In 2016, as in prior years, most Medicare beneficiaries (81%) had a choice of at least one “zero premium” MA-PD8 plans that charge no additional premium for coverage, other than the monthly Part B premium. Between 2015 and 2016, the share of enrollees in zero premium MA-PDs remained relatively unchanged (48% in 2015 versus 49% in 2016), about the same share as in 2010 (Figure 8). 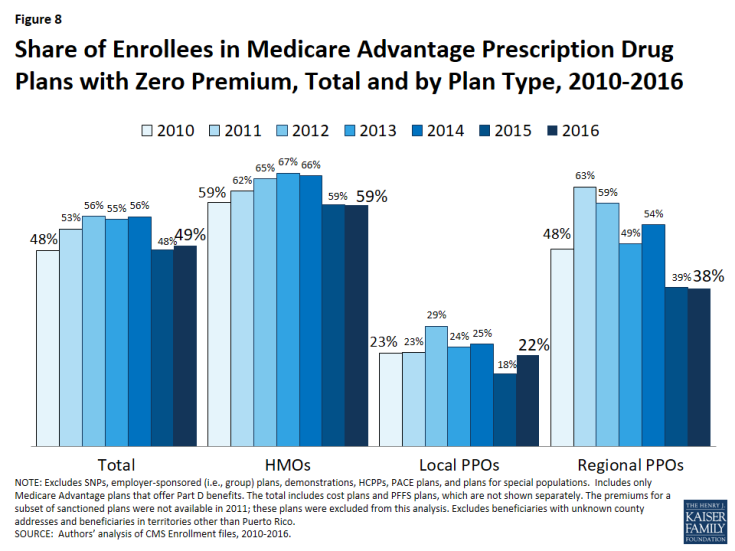 Similar to prior years, a larger share of HMO enrollees is enrolled in zero premium plans (59%) than regional PPO enrollees (38%) or local PPO enrollees (22%). No zero premium PFFS plans were offered in 2015 or 2016 (Table A4). Comparing premiums across states is complicated by the fact that premiums reflect many factors, including the underlying costs of care in a given county relative to the national average, the level of payments to Medicare Advantage plans in the area, and firms’ strategy about whether to use plans’ rebates to offer extra benefits, reduce cost-sharing, or lower premiums. Additionally, as previously discussed, premiums vary across plan types and enrollment by plan type varies across states. Everyone and their mother seems to have a strong opinion about work-life balance. Some argue that balancing career and lifestyle is necessary for your overall happiness. Others argue that the concept of "balancing" your work and your life, which implies that the two are on par with one another, is plain old wrong. Still others argue the whole thing is completely imaginary and unrealistic, and that we're making ourselves unhappy by pursuing it in the first place. But a lot of what we read about it in popular culture barely scratches the surface. There's a ton of cool, crazy research and science out there that's uncovered meaningful insights about work-life balance -- from how it affects our individual happiness and success to how it should affect the way companies are run. Curious what the smartest people out there have to say about work-life balance? 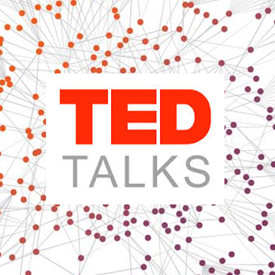 Check out these eight TED talks that dig in to the more unconventional and uncommonly useful advice when it comes to balancing career and lifestyle. 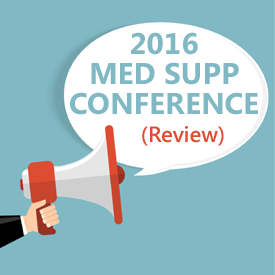 The CSG Actuarial team attended the 2016 Medicare Supplement Insurance Summit in Kansas City, MO last week. Their actuaries had the opportunity to present on the status of the Medigap market, and trends they anticipate will impact the industry. Copies of their presentations are available for download below. As an added benefit at this year’s conference, all sessions were filmed. In the coming weeks, recordings will be available online for free to all. Be sure to visit www.medicaresupp.org to see presentation details in the program, and watch for video sessions to be posted.